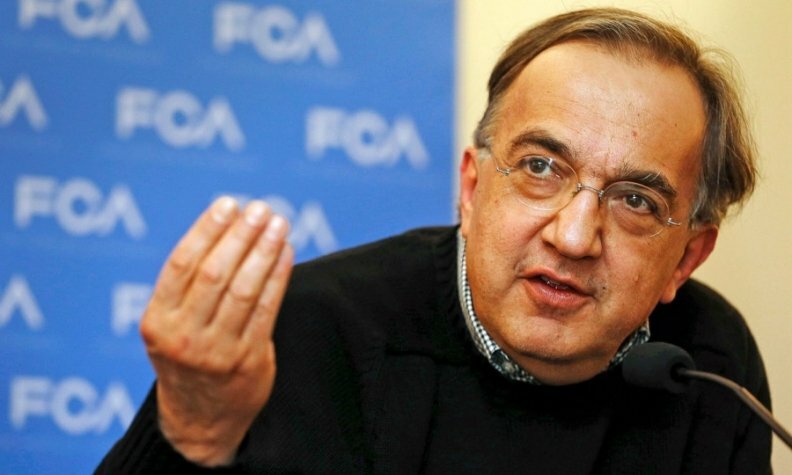 Marchionne exercised stock options granted in 2006. MILAN (Bloomberg) -- Fiat Chrysler Automobiles CEO Sergio Marchionne made about 10.7 million euros ($13.4 million) from a surge in the automaker's share price after he announced a plan to spin off Ferrari. Marchionne exercised options for 6.25 million Fiat Chrysler shares on Oct. 30 and sold that amount of shares by Oct. 31. He did the same for an equal amount of stock in CNH Industrial NV, the truck and tractor maker that was previously part of the Fiat group. After spending 83.6 million euros for the Fiat Chrysler and CNH stock, proceeds of the transactions totaled 94.3 million euros, according to filings posted today on the website of Dutch financial-markets regulator AFM. The stock options would have expired at the beginning of November. Fiat Chrysler shares in Milan surged 13 percent on Oct. 29 after the company announced plans to sell 10 percent of the Ferrari super-car brand to investors and distribute the rest of its holding to its own shareholders. The spinoff underpins Fiat Chrysler's plan to raise about 4 billion euros by creating demand for a mandatory convertible bond and a share sale. The deal gives the carmaker, now based in London, cash to cut debt and meld Italy's Fiat and Chrysler into a single entity that can better challenge General Motors Co., Volkswagen and Toyota Motor Corp. Exercising the options, which were granted in 2006 and would have expired Nov. 3, would have been less profitable for Marchionne immediately prior to the Ferrari announcement. Selling the holding at the Oct. 28 closing prices would have made Marchionne just 3.4 million euros. Still, Marchionne's deal didn't maximize the value of the options. In April, when Fiat shares hit their highest level since November 2007 and CNH stock was 25 percent above last week's level, the shares were worth 108 million euros. That would have made Marchionne a profit of 13.7 million euros more at that time. A Fiat representative declined to comment on the CEO's transactions. Marchionne, 62, who has said he plans to leave Fiat after implementing a 48 billion-euro investment plan that's due to run until 2018, owns 6.83 million Fiat shares and has options for another 10.67 million shares, the filing shows. The CEO can exercise those options by January 2016. Under that plan, he can buy one Fiat Chrysler and one CNH share for a combined price of about 6.58 euros, according to Fiat's website. He is also entitled to receive stock grants as part of a 2012 remuneration plan.